Thanks for all your questions and feedback on my last post on making ramen noodles from scratch. One of the questions that was asked was: "What if we don't have a pasta roller, can we still make noodles?" This post is going to be about a hand-rolling technique. 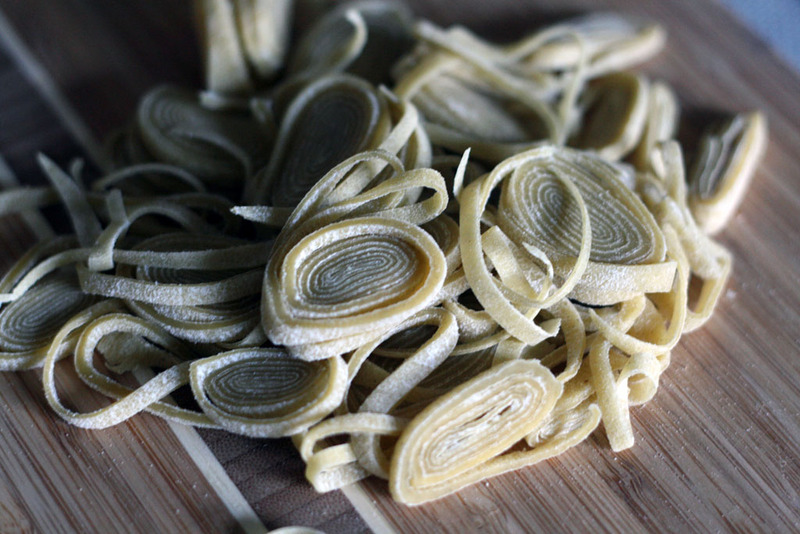 I came across this during my attempts at making Soba Noodles (coming in a later post). 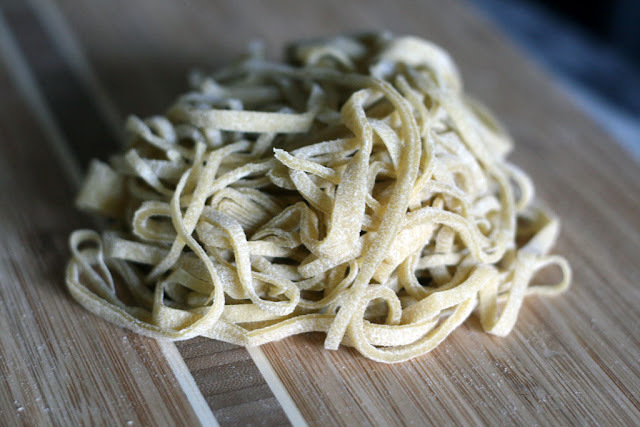 Soba noodle making involves a series of complicated kneading, folds, and rolling which I won't be covering in this post. 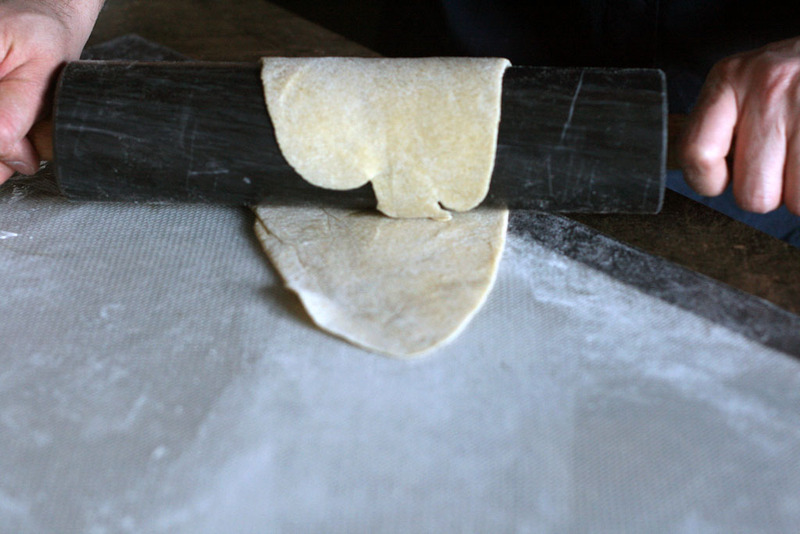 Instead of a pasta rolling machine you'll need a rolling pin and a sharp knife (preferably one with a flat edge like a cleaver). Follow the recipe for creating the dough for ramen (ver. 8) up to dividing your dough into 4 portions. The size of the portion I'm working with is about the size of a closed fist. 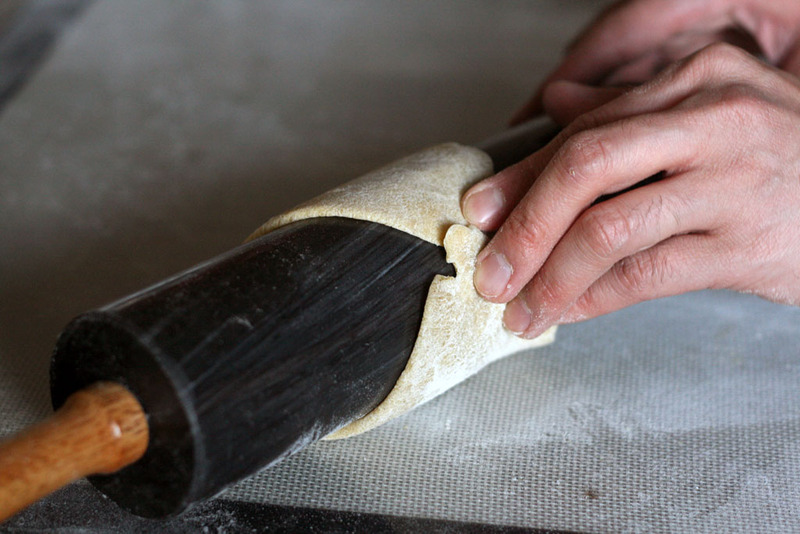 Using a rolling pin and starting from the middle of the ball, roll out in both directions (e.g. 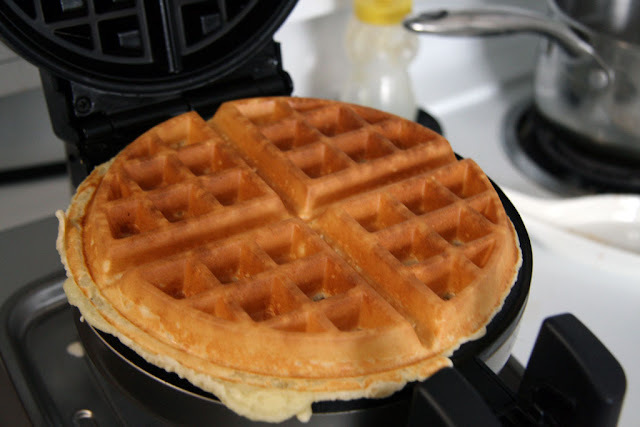 middle upwards, middle downwards). Keep going until you can wrap the dough around the rolling pin about 1 1/2 times (it should definitely overlap) and you see a "tongue". This dough overlaps but not enough! Keep going! Roll from middle out until you can wrap around your rolling pin and the dough sticks out like a tongue. The next step is to roll the rolling pin across while the dough is still wrapped around the rolling pin. 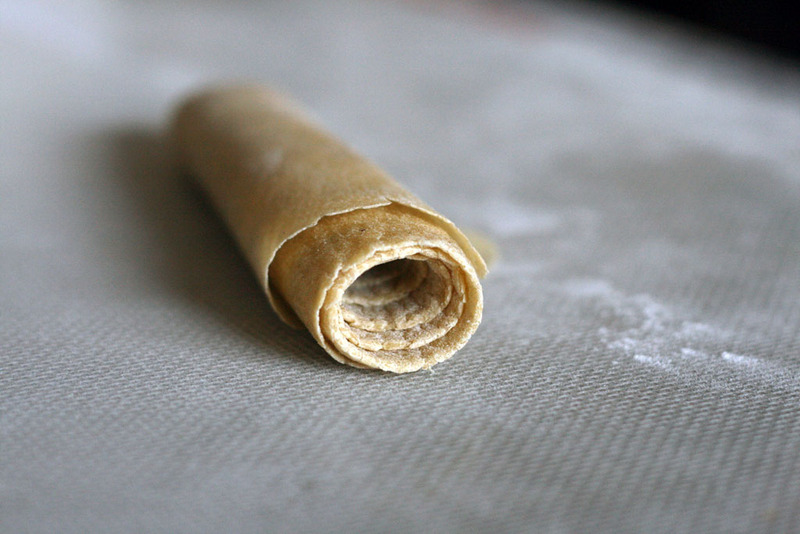 When you reach the edge or end of your surface, don't roll it back, instead drag the rolling pin back to the starting edge. If you roll back in the other direction your dough will unravel. It's more efficient to roll only in one direction instead of back and forth. Keep doing this until you have the desired thinness (keep in mind that the noodle will double in thickness when it's cooked). 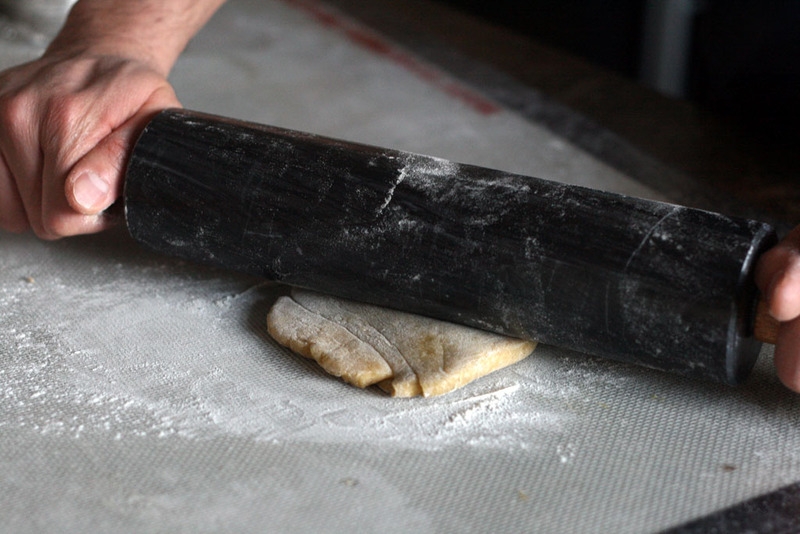 Using your hand, roll up the dough. 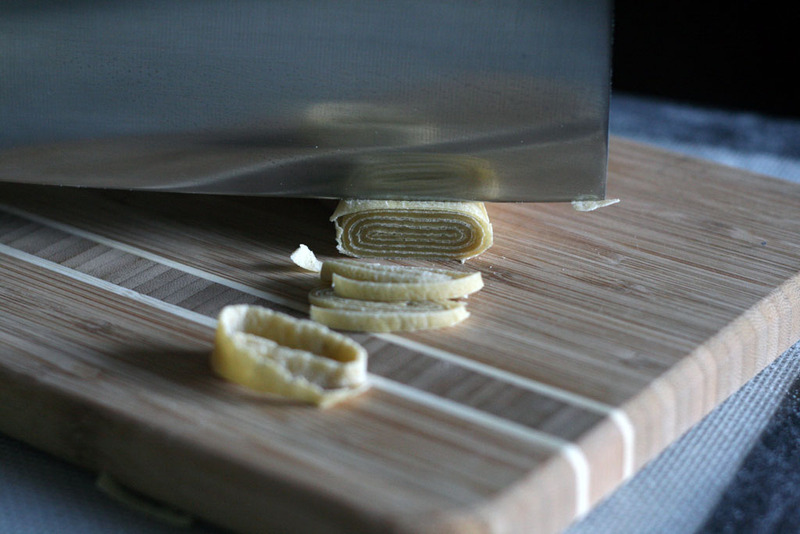 With your sharpest flattest knife start slicing discs from the rolled up dough.Slightly tilt your knife so that the disc is separated from the roll. Using your hands, unravel the discs of noodles into a pile. There you have it, hand-rolled, hand-cut ramen noodles without a pasta roller. Once you get used to the technique, it doesn't take a significant longer amount of time (about 5-8 minutes more) than using the roller. 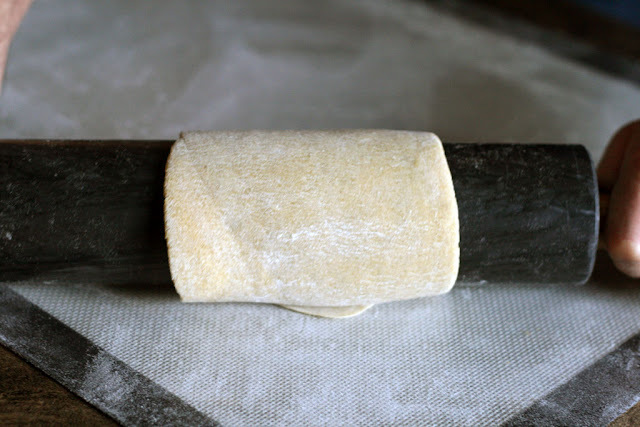 The pasta roller is definitely more efficient compared to hand rolling but I've (secretly) tested this on Lillian and she didn't notice the difference (in taste or texture) until I confessed. As mentioned at the beginning, I came across this technique while trying to make soba noodles. I will continue to use this occasionally to practice my rolling technique for our pastas and ramen so that my soba noodle making skills will get better. One of the aspects that I'm working on is to maintain a uniformed rectangular shaped dough throughout the entire rolling process. In other words, the "tongue" should not be a pointed, it should be flat and as wide as the rest of the dough. 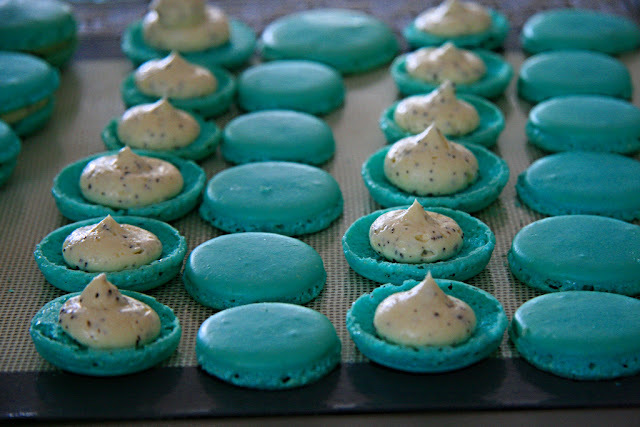 This will prevent weird indentations in your dough.